1. Combine the blueberries, 2 tablespoons sugar and l/2 teaspoon ginger in a small sauce pan with 2 tablespoons water. Heat, over medium high heat, stirring frequently, just until some of the berries burst and a sauce forms. Add up to 2 tablespoons extra water, if necessary. Reserve. 2. 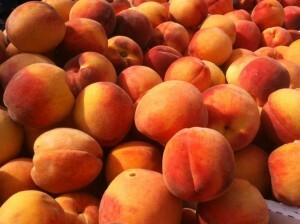 Mix the ricotta, vanilla, l sliced nectarine or pealed peach, l-1/2 tablespoons sugar, and l teaspoon grated ginger. 4. Heat the butter over medium heat in a large non-stick skillet. Carefully add the blintzes and cook, until well browned on both sides and warm all the way through, about 2-4 minutes on each side. Add the nuts during the last minute of cooking, stirring frequently to prevent burning. Place a blintz in the center of each plate. Spoon the blueberry sauce over. Sprinkle with the remaining nectarine slices and the toasted nuts, if you are using them. Serve immediately.